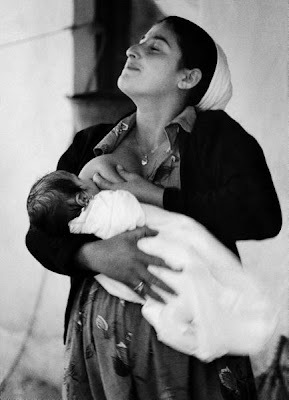 Kurdi mother, one of the most primitive tribes of Israel, ecstatically breastfeeding her child in mountain colony outside Jerusalem. Israel, May 1960. I saw a woman nursing at Incredible Pizza last night and thought of your Magical Milk pictures. She didn't even have a nursing cover. It made me smile! Well, we were created to be naked I suppose. This is a great picture, I love the look on her face and her posture, so very expressive. I love it! What a beautiful picture!